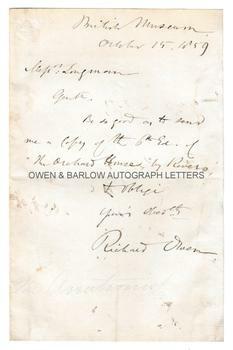 RICHARD OWEN Autograph letter signed. British palaeontologist, biologist and comparative anatomist. He coined the name "dinosaur". ALS. 1p. British Museum. October 15th 1859. To Messrs Longman (the publishers). 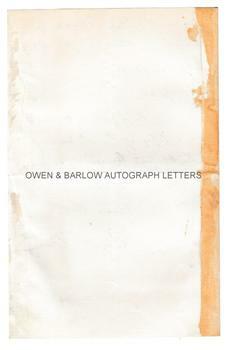 "Gent[leme]n, Be so good as to send me a copy of the 6th Ed[ition] of 'The Orchard House' by Rivers, & oblige yours obed[ien]tly, Richard Owen." 8vo. Approx 7 x 4.5 inches (18 x 11.5 cms). Slight toning. The blank leaf of the bifolium excised to a stub which has previously been used for mounting purposes. Some old mounting residue to verso. All else very good or near fine. The steel engraved portrait captioned "Professor Owen" measures approx. 12 x 8 inches (30 x 20 cms) is engraved by D.J. Pound from a photograph by John & Charles Watkins. It was published circa 1860. Central fold with some toning and with slight mounting traces to verso. 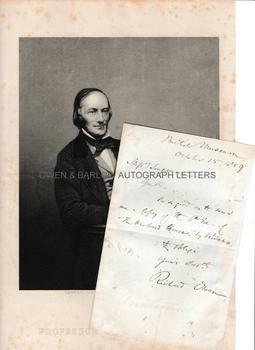 Richard Owen was an important figure in the history of biology and paleontology. He was controversial during his lifetime and not greatly liked by his contemporaries. He was particularly outspoken in his opposition to the theory of evolution propounded by Charles Darwin. He took the view that evolution was a far more complex matter than that suggested by Darwin. 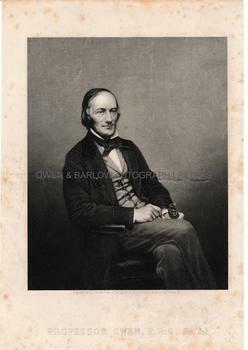 Richard Owen was very skilled in the interpretation of fossil remains. He published the first book on the Mesozoic land-reptiles (which he named dinosaurs) and made the first life-sized reconstructions of these animals. He was also an important figure in the development of public museums and was largely responsible for the creation and opening of the Natural History Museum in London - the first of its kind.